SMM Steel Canopies proudly presents the SMM by Milford range of roof racks. 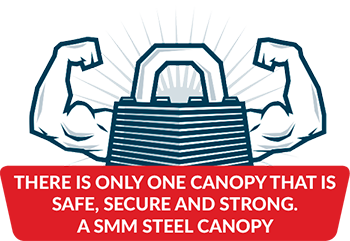 With three different models designed to fit all SMM canopies, you will easily find one to suit your needs. The SMM by Milford ErgoRack is the answer to easy ladder transportation. The ErgoRack is operated from the ground, so there’s no need to lift heavy loads above your shoulders or climb onto the roof, tow bar or bumper to load your ladder. It comes with an auto clamp feature that automatically restrains your ladders for safe transport. It features a lightweight, powder coated aluminium design that ensures a high load capacity can be carried on top of the rack. The SMM by Milford EcoRack Cargo provides high load capabilities even with limited OE roof load ratings, it’s aerodynamic crossbars reduce fuel consumption and is almost silent when travelling. It is quick and easy to install, with a heavy duty multiple crossbar design that allows maximum support. It’s corrosion free, lightweight, constructed of anodised aluminium construction with stainless steel fasteners, and also comes with ladder roller configurations. The SMM by Milford EcoRack Commercial is quick and easy to install, lightweight and it’s anodised aluminium design offers an economical solution for every type of vehicle. It features adjustable cross bars which can be mounted to your canopy using inbuilt, channels or gutter mounts. It comes with 2 hi-load crossbars giving it a high load capacity. *Tested as per requirements of Australia Standards AS1235-2000 & ISO/PAS 11154 2006 standards.